Looking to take the next step after community college? Or perhaps you’ve decided that your first college choice is not the right fit to help you achieve your goals. Wilkes University welcomes applications from students seeking to transfer from another institution. We offer the resources of a large research university in the atmosphere of a small, liberal arts college. Here you can get to know professors one on one, immerse yourself in hands-on learning opportunities and internships, and dive into one or more of our 100-plus clubs and organizations. Our transfer counselors are ready to help you get started. They'll review your transcripts and evaluate course credits. You can also use the online tool toward the bottom of this page to see some courses that transfer from specific institutions. Wilkes accepts applications on a rolling basis. That means you will know your admission decision within a few weeks of completing your application. Click here to apply online. Official High School Transcript(s) and SAT or ACT scores (If you attempted more than 30 college credits, please contact your admissions counselor to waive these requirements.) *Admission testing may be available for adult learners who have not taken the SAT or ACT exams. Nursing applicants: Click here for more information and additional application requirements. Musical Theatre and Theatre Arts applicants: Auditions are required. Students not interested in seeking a degree from Wilkes and who are either looking to take any course(s) for a given semester or who will transfer their credits back to their home institution, should complete our visiting registration application. Please click here for our visiting registration process and application. Want to know quickly if you're admitted to Wilkes? Schedule an instant decision appointment by contacting the admissions office at (800) WILKES-U Ext. 4400 or admissions@wilkes.edu. Complete the online application, bring your official transcript(s) and scores with you to the appointment, and admissions counselors will review your documents and give you an answer before you head home. NOTE: Instant decisions are not available for nursing applications. 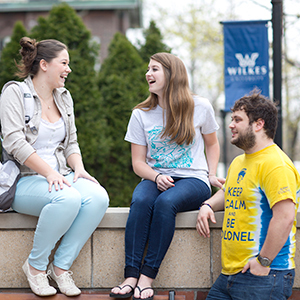 Ensure that Wilkes is the best fit for you! Take some time to tour our campus and meet your admissions counselor, faculty and other campus staff. Request your own personalized visit or visit us during an Open House. Contact our admissions office at (800) WILKES-U Ext. 4400 or admissions@wilkes.edu or schedule your visit by using one of the below links. Wilkes will review transfer credits from college/university courses in which a student has earned a C (2.0) or higher. Click here to visit our transfer tool with available course equivalencies and core requirement equivalencies for a few listed colleges/universities. Please note: some institutions and courses may not be listed, but courses may still transfer. Please contact your admissions counselor for other courses. Transfer Students from two-year institutions must complete a minimum of sixty (60) credits at a baccalaureate degree-granting institutions. All transfer students must complete a minimum of thirty (30) credits (exclusive of advanced placement credit award by Wilkes) and one-half (50 percent) of their major field credits at Wilkes University. To be eligible for honors at graduation, you must obtain sixty (60) credits at Wilkes University. As part of the admissions process, veterans are required to submit their official Joint Services/Military transcript(s) the the Admissions office. Veterans will also need to submit their Certificate of Eligibility to Wilkes' Veteran Counselor, Lt. Col. Mark Kaster. Wilkes University is pleased to participate in the U.S. Department of Veterans Affairs' Yellow Ribbon GI Education Enhancement Program. This program allows Wilkes to cover post-9/11 veterans' tuition expenses that exceed the highest public in-state undergraduate tuition rate. Wilkes can contribute up to 50% of those expenses, and VA will match the same amount as the institution. The Yellow Ribbon Program is a provision of the Post-9/11 Veterans Educational Assistance Act of 2008. Click here for more information. Our Veterans' Services assists all veterans, and their families, who are currently serving or who have formerly served our country as they pursue their higher education at Wilkes University. Click here for more information. Lt. Col. Mark Kaster, USAF Ret. What Courses Will Transfer To Wilkes? Above is an incomplete list of institutions from which Wilkes transfers credits and an incomplete list of courses that transfer into Wilkes. If you do not find the institution or course you are looking for, it does NOT necessarily mean that Wilkes does not accept credits from that institution or that Wilkes does not transfer that course. The database below is not comprehensive; Wilkes adds institutions and courses on a weekly basis. Please contact a transfer counselor to learn about institutions or courses that are not on the list.